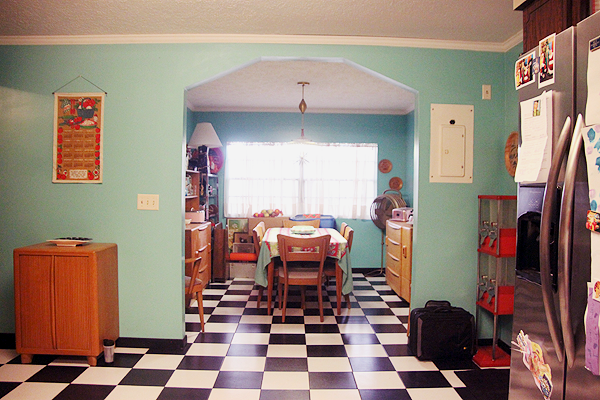 The kitchen reminds me of my 2nd apartment, which I impulsively selected for the black and white checkered tile! Absolutely beautiful! 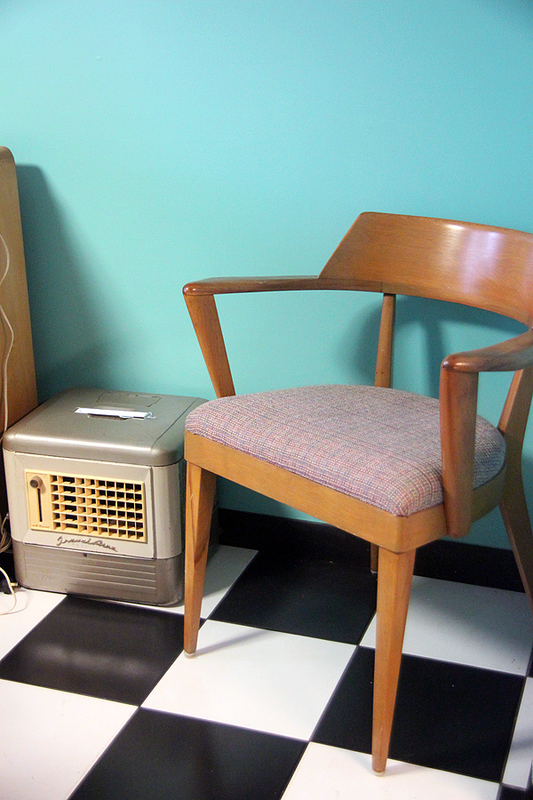 There was lots of mod Wakefield furniture and beautiful vintage mid century modern collections on display. I spent a few hours taking 114 photos, I may have make another post or two just about all she's collected and displayed! 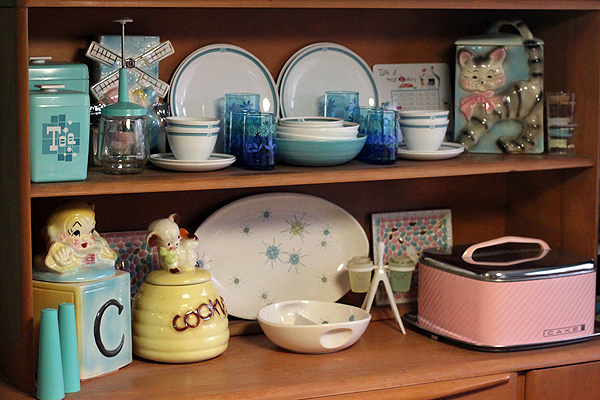 But before that posts is live at I'll at least share another peek at the glorious mod kitchen goodness she's amassed, love the soft pastel palate she went with! 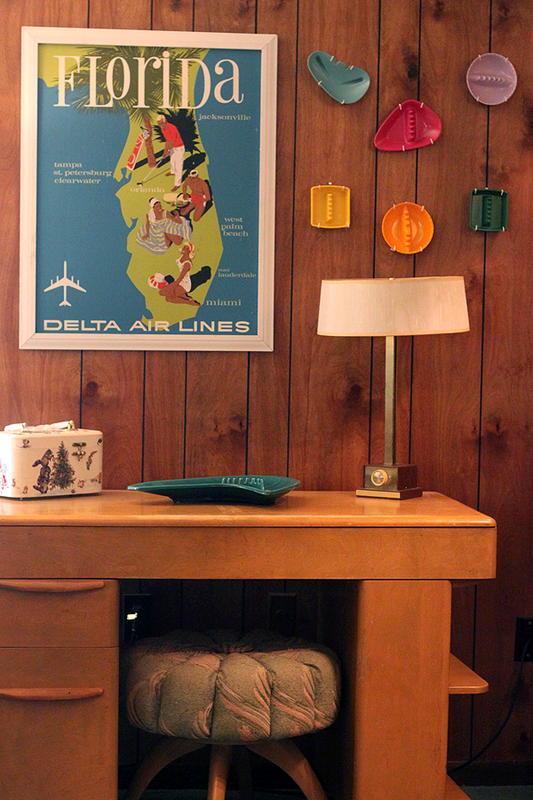 Moving on to the cozy mod-filled wood paneled living room, I appreciated how she hung ash trays as art pieces, too clever! I may have to borrow that ideas. The huge entertainment center installation had to be hauled in with a large truck! The hassle was well-worth it, I'd say! The quadrants each housed their own collections. So inspired, I want to build something like this to house my huge amount of vintage finds. 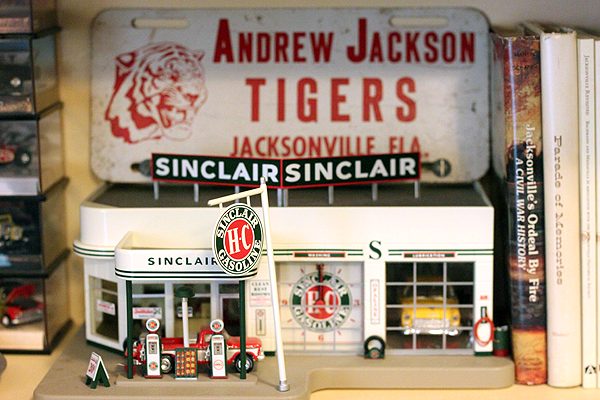 I for one appreciate the huge Sinclair Gas Station collection. Their mascot was a dinosaur! Beautiful. I appreciated how relaxed and comfortable the family home was despite all the vintage on display, everything was well organized and balanced. 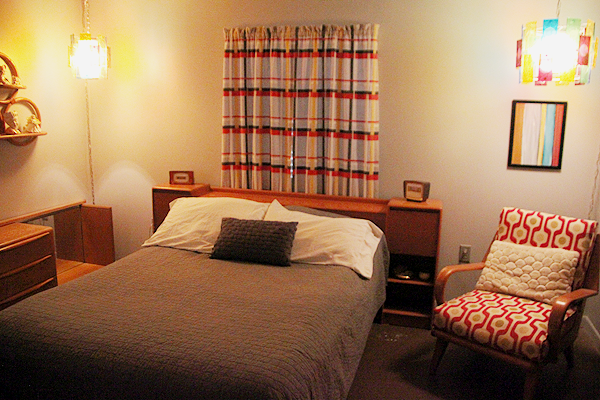 The bedroom was charming and restful, love the installed light fixtures and red/plaid/teal color scheme going on in here. Symmetry! 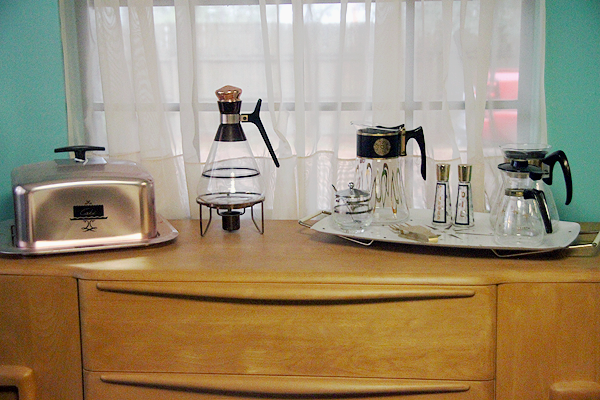 Love the atomic era alarm clocks on the night stands, too. The curtains in particular and really dreamy and let the light in so just enough for a calming diffused light situation. And this reminds me to get my vanity put together! Love this piece and all that's displayed on it. 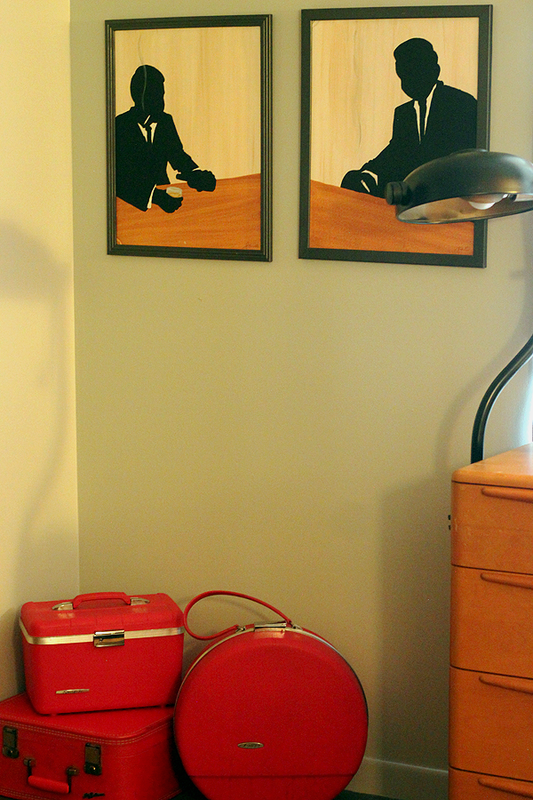 The red vintage luggage collection and Mad Men inspired local artwork is a nice touch the set the vintage scene, too. I loved how the collections were local and personal. 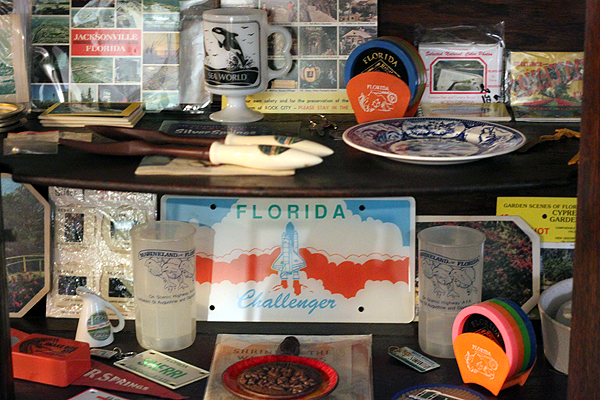 There was lots to see and read about local and Florida-wide attractions and history. And retro road trip and road side attraction goodness! I would love one of each, please. Great collection! 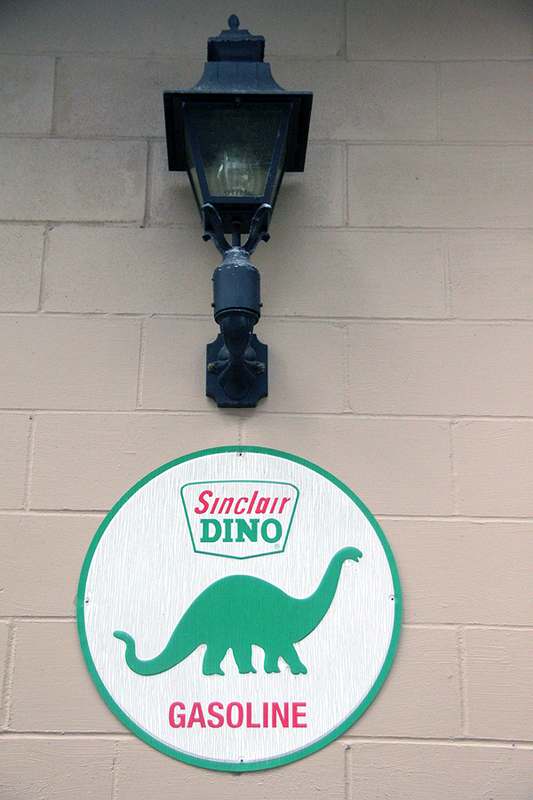 Moving along to the back yard, love this Sinclair Dino sign! Want! 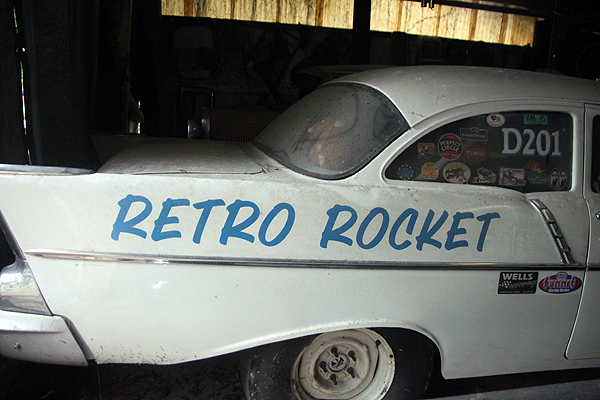 Retro Rocket, anyone! 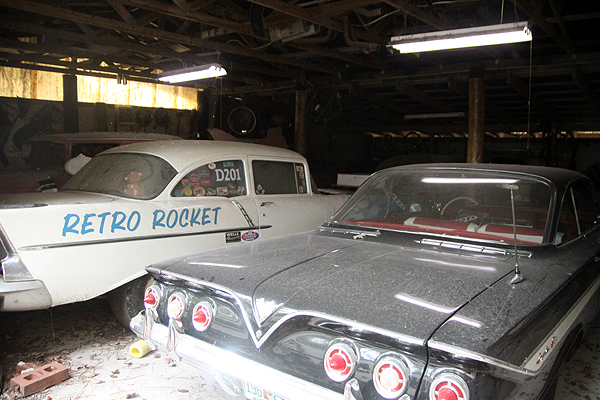 Look at these beautiful vintage cars! So glorious. I would drive this car every day with pride, I would! 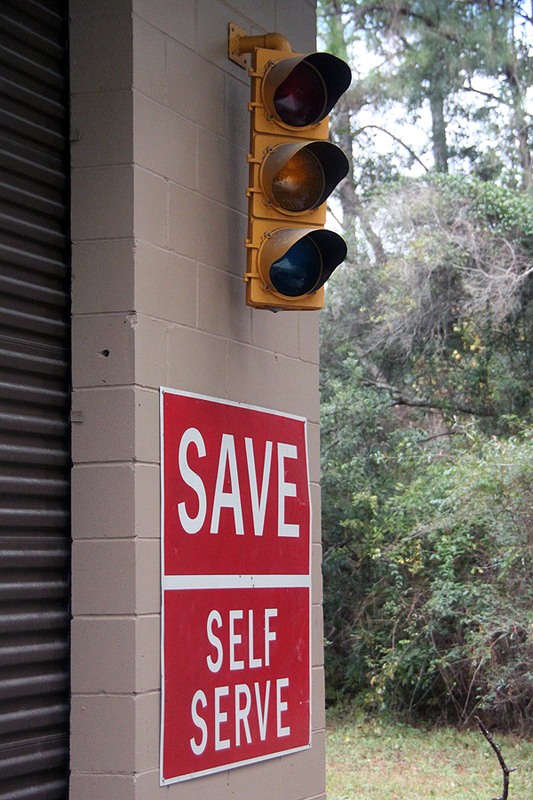 I was told the kids used to play red light green light with the real thing you see above. Next time I'll have to show you the inside of Gertrude, she's being renovated at the moment. The inside has an awesome orange/brown retro theme to match the exterior. Was pleased to see a lot of my retro wares inside! 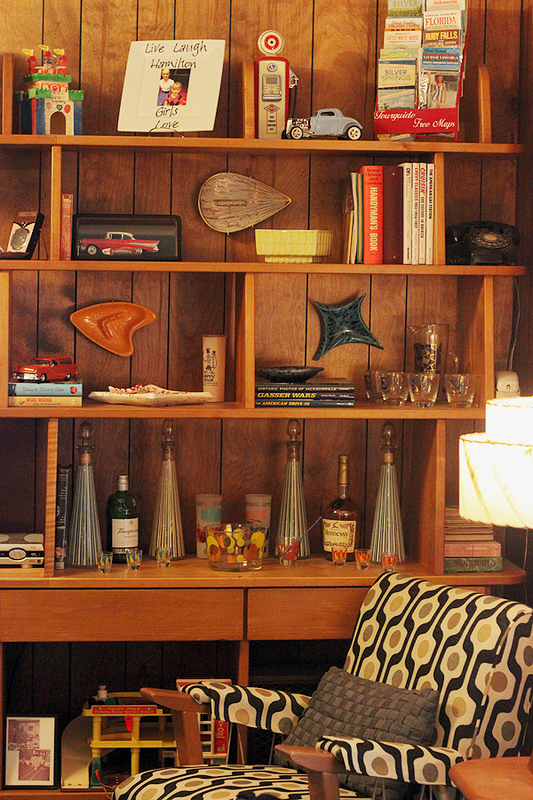 I will definitely have to share more from this beautiful retro household curated and collected with such care. 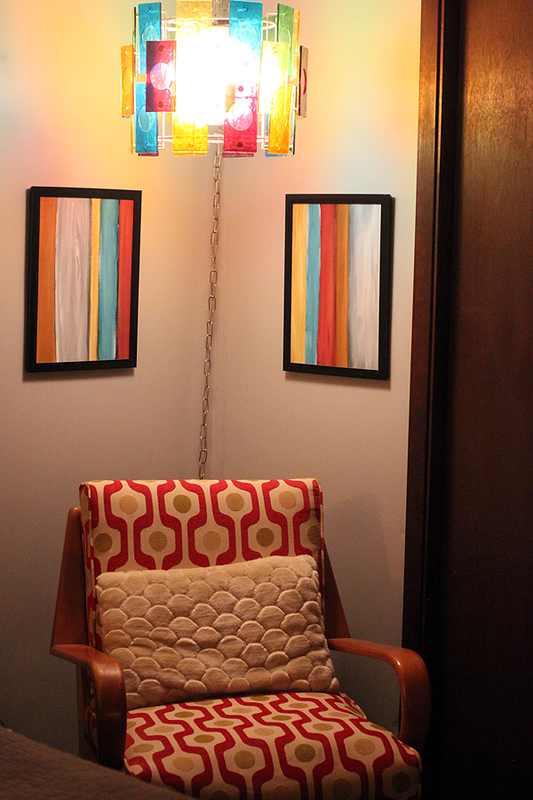 What's your favorite element of Sherry's home? It's hard to choose for me, maybe the Sinclair collection and that amazing wall display!? I will forever seek one like it! what an amazing place! i love their collections, especially the florida one! it looks like a cool museum in those cases! i love that they have a lot of stuff out on display but it doesn't look like a junk shop. that is a hard thing to do! I agree, very classily displayed collections. I have many more collections of theirs to show off in future posts. Amazing shelving in the first photo-- wow! Love Heywood W furn. 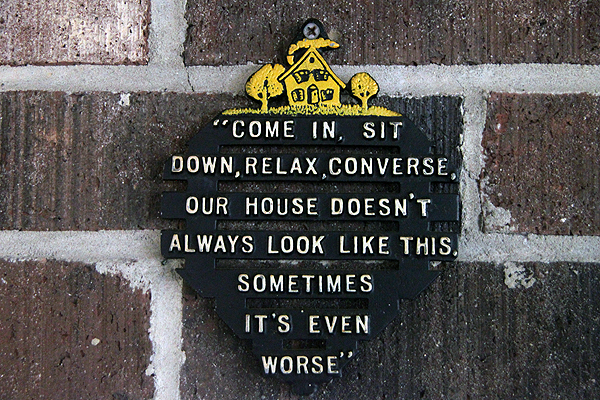 My grandmother had some of their LR furniture. When she broke up housekeeping, I was too young to care about furniture. Wish I had that to do over again! I need something that shelf in the first photo, such a glorious statement piece. Haha, I love ash trays but they are indeed hard to move :P By my count she has 10 amazing ones in the first photo alone. I've sold some ash trays but they do tend to be a slower sale. No prob :) Will be sharing more of their finds soon. You have captured my wonderful brother & sister-in-law's collections so beautifully! Their collecting has been a long labor of love and I love that you focused on the personal family aspect that has been the driving factor behind much of their collection. Thanks for sharing! Great photos and I love the tour. This is a great feature you added Van! Thanks for sharing the link, definitely going to check it out! Lovely! I love when people can capture the MCM look and still maintain a homey quality. 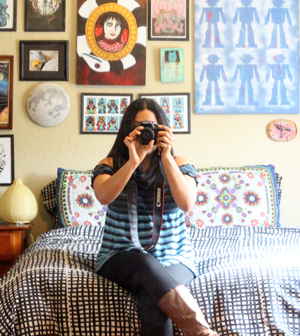 Strangely enough, my favorite part is the bedroom curtains! I LOVE those bedroom curtains too, great weight too 'em you can see even in the photos. What eye candy! I would love to live in a home such as that. Thanks for sharing it! No problem Nancy, I'll be back to document her Christmas explosion, too! Me too! May have to borrow the idea someday ;) I tried that with my favorite plate but the hooks wouldn't fit to hang it. Wow such a cool house! 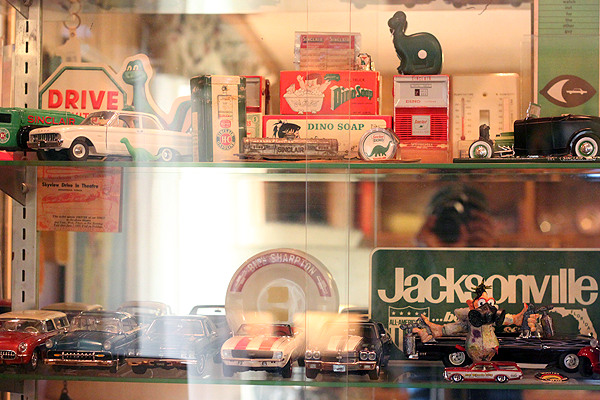 They really do have an amazing collection of vintage goodies, I'm so jealous. Love all the Heywood Wakefield furniture, the shelving unit and like a bazillion of their collections. 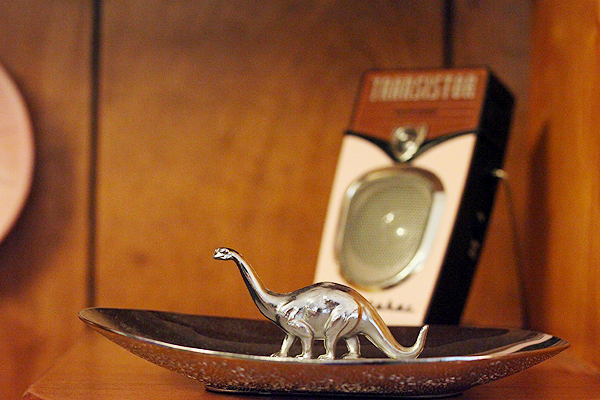 Such a great idea to display vintage ash trays on the the wall. thanks for sharing this Van, you'll definitely have to do another post with some of your other photos! Will do the follow-up with her collections and of her amazing Christmas collection, too. This house is amazing! 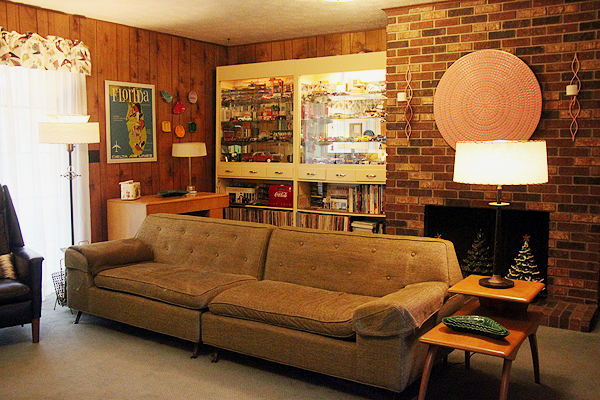 I'm loving how they have so much retro goodness, and yet the house doesn't seem cluttered at all. They've done an amazing job putting everything together! That they have. They had a lot of awesome retro books and information on MCM and our city's history. The Florida poster would be missing if I came to visit. The graphics are super. Wonderful tour, thanks for sharing. I like too many different eras and styles to stick with one, my house looks like a museum threw up. There are these wonderful, wonderful plate hangers that you wet and stick to the back of a plate (or ashtray). They work SUPERBLY and there are different sizes to hold different weights. This is so good. Haywood Wakefield isn't everyones cup of tea, but I happen to love it!!! I'm drooling over here. 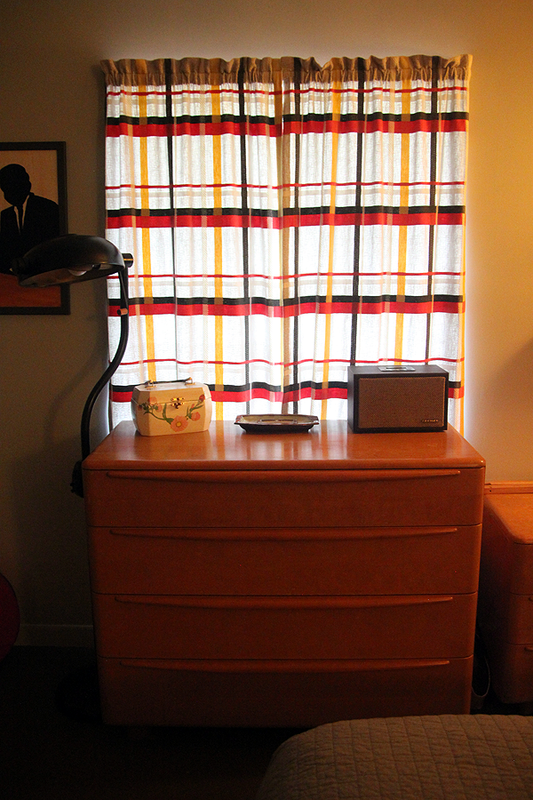 I love Haywood Wakefield and have a nightstand and vanity set of it. :D It's not "mod" enough for some I'm finding but I really enjoy it. It is! If a spare room opens though I call dibs, bwahaha. 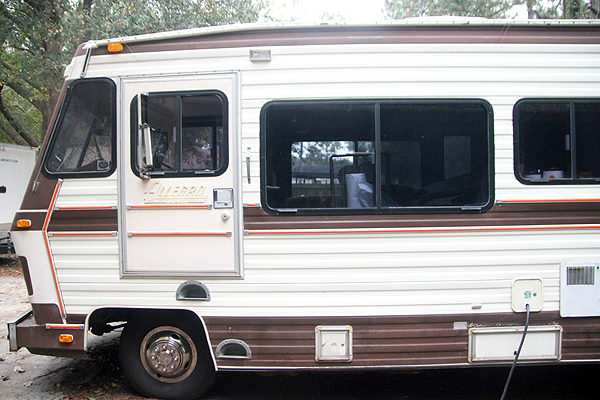 We could share "Gertrude" the RV out back. Woweeeeee! What an incredibly gorgeous home! The collections are just perfect. OMG, thanks so much for sharing this! I LOVE it! This is the way to curate and display items from a specific period without looking like an episode of Hoarders! I love the square cake carriers. 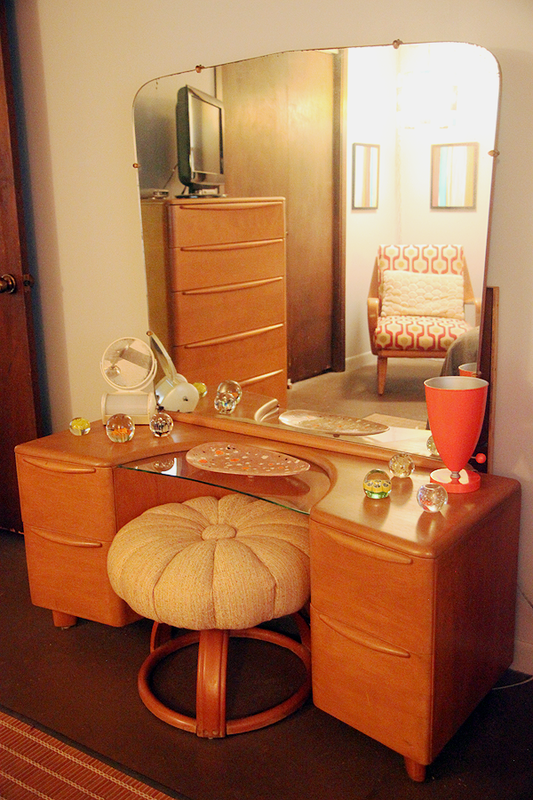 I love the furniture - the bedroom chest of drawers and the vanity, that chair in the last photo. 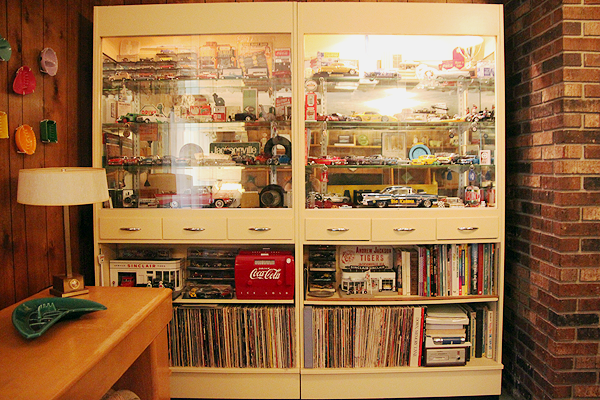 I love the white display case in the family room. But I think my most favorite item is that huge entertainment center/shelving unit! That is massive. 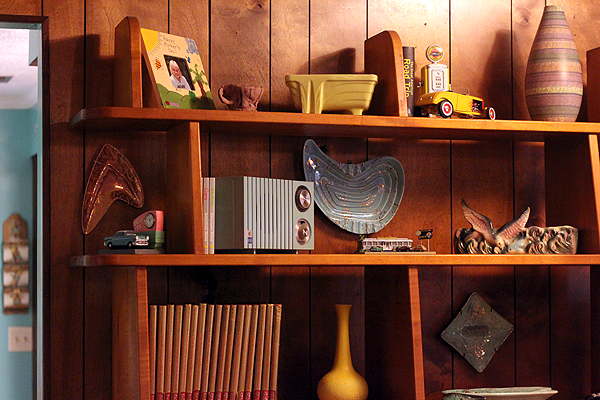 I love all the little display units built into it and how Sherry used it to house her little collections. 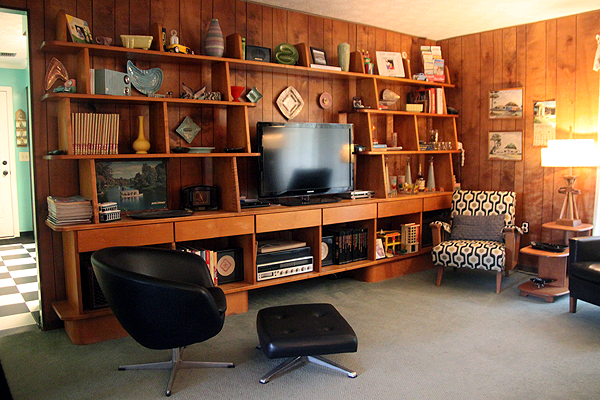 I even love the wood paneling in the family room, and usually that looks very dated when I've seen it in other homes. I am going to send a link to this post to a friend of mine who loves and collects MCM items and has an impressive collection herself. All I can say is, "WOW!" I would LOVE that unit, it's incredible. :D ! I may have to enlist help constructing one like it if I don't find one. If you put all the stuffs in a single place then it is not looking good. I think you should place all antiques in systematic manner so that you can find anything fast without searching each and every thing.